Geese and ducks belong to the family Anatidae. These birds are extremely widespread, are the object of hunting. Many species of geese and ducks before the onset of cold weather and migrate to warmer climes. And where exactly flying wild geese and ducks? Greylag goose – the ancestor of all breeds of domestic geese. This bird is a huge natural habitat: it lives in the temperate zone of Eurasia from Lapland to the Far East. 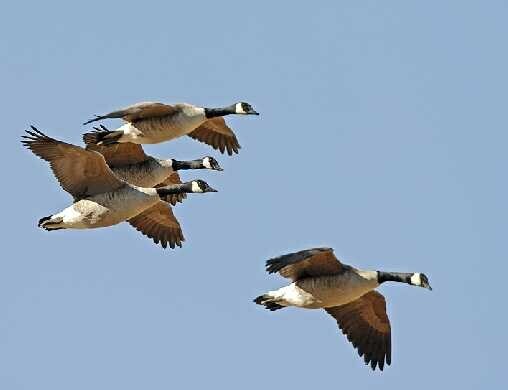 Winter months geese is carried out in more southern latitudes – from the Mediterranean to India and China. White goose lives in the high latitudes of North America. Sometimes it nests in the East of Eurasia – Chukotka, Wrangel island. Once he was there very prevalent, but now the number has decreased significantly. For the winter white goose flies to Mexico, the southern States – Florida, Texas, Georgia, California, Louisiana, as well as the Islands of the West Indies. Can sometimes winter in southern areas of China and Japan. The Egyptian or Nile goose, inhabiting the territory of Egypt and the Sudan, norwhere it doesn't, as the climate in those places year-round warm, and the bird is always provided with food – insects, worms, fish. The most common of the wild ducks living in Russia, the Mallard, the ancestor of all domestic ducks, which got its name because of the characteristic quacking cries. This bird is very bright, effectively painted the head and part of the neck the males have emerald-green color, breast, brown back and sides mottled with white, black and brown spots. But such coloration is characteristic only of the male mallards, and then only in the mating season, after the plumage becomes nondescript, gray-brown. Habitat mallards extremely wide – it inhabits almost the entire territory of Eurasia, the most part of North America and North Africa. Those Mallard ducks that live in Northern latitudes (including in Russia), before the onset of cold weather, gather in large flocks and fly South. Mostly they winter in the European Mediterranean countries such as Greece, Spain, Italy. But some mallards fly to North Africa and even to India.Among the smaller species of ducks are the most widely distributed Teal-trescone. It inhabits almost the entire territory of Europe (not affecting only the northernmost areas), and also in some parts of Asia. Before the onset of cold weather Teal-crescono flies to winter in southern parts of Asia, and North and northeast Africa, only a little before they reach the equator.